You are stronger than you think – Hadrian’s Wall preparation – This fat lady can walk! 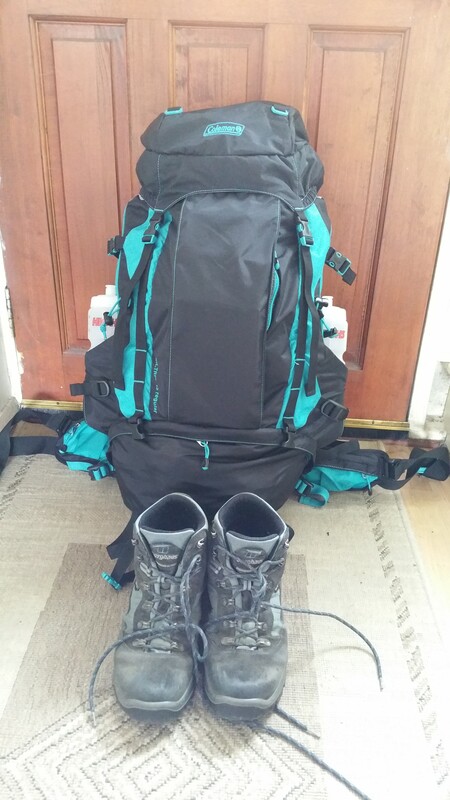 Last week in preparation for my Hadrian’s Wall walk I put a lot of weights into a rucksack to get a feel of the weight I could potentially have on my back. I put 2 stones in weight in the rucksack and tried to lift it. It was so heavy. That really hit home because I’m more than 2 stone overweight and yet I can carry that weight up and down mountains. That was the point at which I realised how strong I have now become. When those of us who are overweight walk we burn off more calories than our slimmer walking friends for the simple reason that are bodies have to work harder. My leg muscles are now strong enough to lift and carry my weight up and down mountains with very little discomfort. I no longer get aching muscles although I do get some nerve pain in my joints. I’ve had a conversation with my doctor about pain to identify the point at which I should stop. At my doctors request I will be carrying out this walk taking pain killers but he is 100% behind me doing this walk. Those of us who are overweight do have to listen to our doctors. This is not about being reckless in pursuit of a goal. This does not mean you have to give up on the goal. Hadrian’s Wall is often done in about 5 days. I’ve decided to do my walk in 9 days. My first days walk is my shortest and also on the flat. This is so I can ease myself into the walk and get use to walking with the heavier rucksack. My second day is a bit further but still well within the distance that I know I can walk comfortably. The next part of Hadrian’s Wall is the steepest and I have planned 2 days to complete this section. I have then planned a day’s rest. After that the walks do get longer. My second to last day is the furthest and 2 miles further than I have ever walked. One of the reasons that I prefer to walk rather than go to the gym or run is because it’s too easy for me to give up. I am basically lazy if I can be. You can jump off a treadmill or you can slow to a walk when out running. When you walk you have to get back to the car or get home so you just keep going. Most of the time, you have no choice. That is the way that I have actually built up the distances that I walk. Last year is when I really started planning to walk Hadrian’s Wall. I bought a guide book and a map and started reading about other people who had done long distance walking. Not necessarily Hadrian’s Wall but the process of doing a long distance walk is much the same whichever one you do. There were recurring themes I found in these books. This isn’t just about being physically fit it’s also about being in the right mind set. If you believe you can do something then the chances are you can. If you have doubts you will fall short. Even with the best will in the world there will come a point on this walk when I will doubt myself, when I’m tired or hungry I will be very close to giving up. Every one of those books who describe this say just sleep on it. When you’ve had a good meal and a good sleep the next day you can start the walk and you will undoubtedly find you will feel different. On that first walk up Helvellyn that I did training for the 3 Peaks I doubted my ability to get up that hill. It was harder than I imagined and I reached that point. I didn’t give up however and when I reached the top I was amazed at how good I felt. My recovery rate was actually really good. You do get an adrenaline high yes but I wasn’t breathless anymore, my joints felt great and I felt that I could have continued for miles not just the descent. When I choose mountains to climb now I try and choose a route where you might have a very steep climb, then a flatter section to recover before a final steep ascent. That is what works for me. That is why I have chosen to have that recovery day. I have not had a specific training regime in preparation for this walk. From reading the books I knew that I had to walk between 8 to 15 miles a day to complete the Wall. I knew that some days would be up and down hills and some days are flat and mainly by road. I also had to be able to walk on consecutive days. The day that I achieved my first target of 8 miles last year was a major achievement. I have walked 8 miles before but it’s always been up a hill and then down. This 8 mile walk was up and down hill all the way. The final section of that walk was uphill and the hardest section. By this time I was tired, I was cold and also wet….it was August bank holiday! I found that I would walk a few steps and then collapse to the ground unable to walk, then I would pick myself up and then do a few more steps before collapsing again. It doesn’t matter if you have to stop several times getting up a mountain the point is eventually you will get there. For me it’s about controlling my breathlessness. That has and is still my biggest struggle. That is why when I walk up a hill I plan how many steps I want to do before I’m going to have a stop. After a while you realise that you hadn’t even noticed that you were going uphill. It’s taken me 2 very long years to get to that point. I still stop on the steepest hills of course. The hardest and most painful walk I have done was actually a 14 mile walk on the flat. You think walking on the flat is easier on your body but it isn’t. It can be more of a strain on your joints plus you don’t have anything particular to stimulate my mind. When I walk up hill I stop and look at the view and I get immersed in that. Walking along a flat path you often have very little to see. My solution to that is either to walk with others or listen to talking books on my iPod. I do belong to walking group and I find that you will often get immersed in conversation as you walk that you don’t realise how far you’ve walked or in some cases again that you are going up hill. When I’m walking on my own I do listen to a talking book. Yet again my brain is immersed in the story so I’m not thinking about how far I’m walking. On this flat 14 mile walk I was 2 miles from home when I could feel a pain in my hip. With nothing to distract me that’s all I concentrated on for 2 miles. By the time I got home I was in agony and my first thought was that I had done too much. Yet I knew I could do that distance. I’ve done it before. After a few days rest I decided to do a similar walk but this time with a talking book. I walked totally pain free for 9 miles. I then decided to walk the same distance but over hills without the iPod and again pain free. My planning of this walk along Hadrian’s Wall has been a journey of mental and physical preparation. I do have contingency plans in place in case something goes wrong but I really hope I don’t need to take that option. I have at this moment a mixture of fear and excitement about the trip. If I don’t succeed then I’m still the fittest I’ve been for a very long time and I believed in myself. Previous Previous post: This fat lady can walk! Next Next post: This fat lady can walk Hadrian’s Wall!